Oops...I posted this on the wrong blog...I forgot this was an exploratory piece and deserves to be here. ..
to read about Brick 2 and 3 click HERE. Things are starting to settle down and I am warping up all my looms to start 'creating' vs. 'finishing'. It never occurred to me that getting ready for gallery exhibits would be so time consuming. I gave a talk at a recent Guild meeting on the topic Is Weaving Genetic. I showed a fair number of photos of my Mothers work as well as mine. My Mother was a textile artist up in the Wine Country of California and she loved tapestry and baskets. 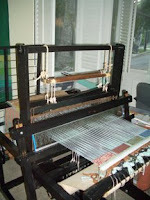 One of the photos I showed was of my Mother's old counter balance four harness loom which is now sitting in my studio. The loom hasn't had anything on it for several years and I thought it would be nice to fill the loom with warp and have some fun. I warped 24 inches at 5 epi [yes...5 epi! Never done anything this wide before] using some fairly thick cotton I had sitting around. I actually don't even know if this stuff will work as warp...we shall see. I actually hand painted the warp with some emerald green, yellow and violet dye. I didn't let the dye sit on the warp too long since I wanted a light value for the warp - just not white. I will be weaving a brick wall in various tapestry techniques. I intend to explore a number of things with my brick wall. I didn't want white warp since I will be having the cement part of the brick wall be exposed warp and explore how negative space can impact color and structure. 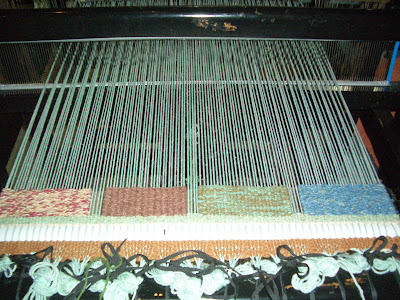 Since I am doing a tapestry on a four harness loom I thought I would also explore how various structures [e.g. twill, basket weave, etc.] can be used to enhance a tapestry by adding texture and shadows. I also intend to use up some of my stash...I have lots of leftover dyed yarns from a variety of projects which I would love to use somehow. I don't want to overly plan this project since I have several other projects which are highly planned. My working title for this tapestry is 'Brick Wednesday'. My goal will be to weave at leave one brick on every Wednesday until the piece is completed. The brick can be whatever I feel like weaving on that given Wednesday. I, of course, can think & plan on the other days but just no weaving on this piece. There are lots of other looms that need attention. Here is how I have started...I have four bricks at the bottom. I wanted to see what a twill, basket weave, tabby and zigzag twill would look like when entirely covering the warp as in tapestry. I didn't vary the yarn or do any tapestry techniques so just the structure would stand out. My closeup photos came out blurry so I will try taking photos again with a different camera.